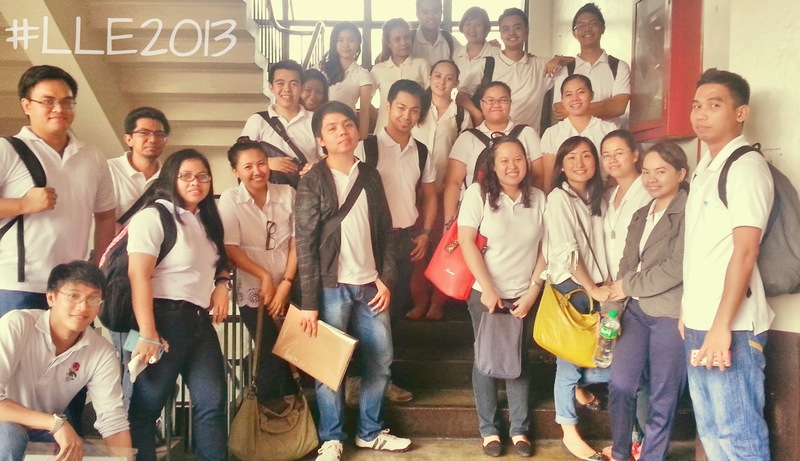 LLE 2013 and How I Thought I Had Failed. Anyway. Ayan. As I've said, it was shocking. More than I ever hoped for. My friends know how nervous I was and how much I panicked. I started to review just a week before the exam. Yes, a week. Seryoso. I attended an Intensive Review from October 14-25 pero a) hindi ako nakikinig/natutulog ako, b) nag-ke-candycrush ako (kasi paksyet 2 weeks na 'di ko pa malagpasan 'yung level 125), c) absent ako madalas and d) all options are possible. I procrastinated and I crammed real hard. Umabot sa puntong parang sabaw na 'yung utak ko, wala na kong naiintidihan/naaalala sa mga binabasa ko tapos mina-migraine na ko. 4 days before the exam, I started feeling really bad. I couldn't sleep immediately. It would take me 2 hours to stare at the ceiling while my mind panics before I could doze off. Partida, I was even drinking melatonin then to help me sleep. Ang hirap. So yeah, kids, I don't recommend that you cram. Fast forward to the day of the exam. A kid outside MLQU begging for alms cursed me. He said "Ang damot mo. Ipagdadasal kong hindi ka pumasa." Siya na nga lang nanglilimos, siya pa galit. Aguy! The exam went on for 2 days, from 8am til 4pm. I couldn't understand most of the questions. Siguro sa 1000 concepts na naaral ko, 10 lang ang lumabas sa exam. Masyadong madugo. Karamihan ng sagot ko hula. I was debating with the questionnaire while I took the test. "Eh depende naman kasi sa sitwasyon!" "WTF! Your questions are confusing!" 'Yan yung mga pinagsusulat ko sa questionnaires ko. Pero ayun na nga, sa wakas, natapos din. And fast forward to today, I ranked # 2. 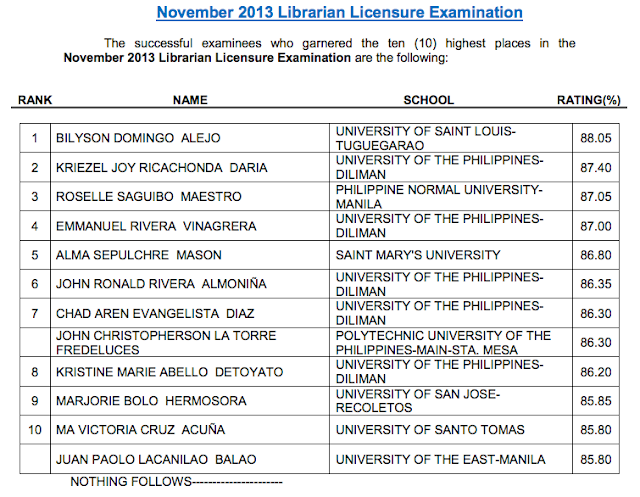 So here, I'd like to thank the people who've supported me during the agonizing pre-board weeks. 6. My former workmates and boss at Engglib. 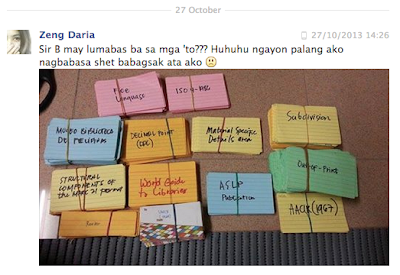 Yes it was really helpful na meron nang experience prior to the exam. Helped me answer the situational questions. Sino pa ba? I might have forgotten some people. Pero thank you to all. And to those who've called and texted today, maraming salamat! 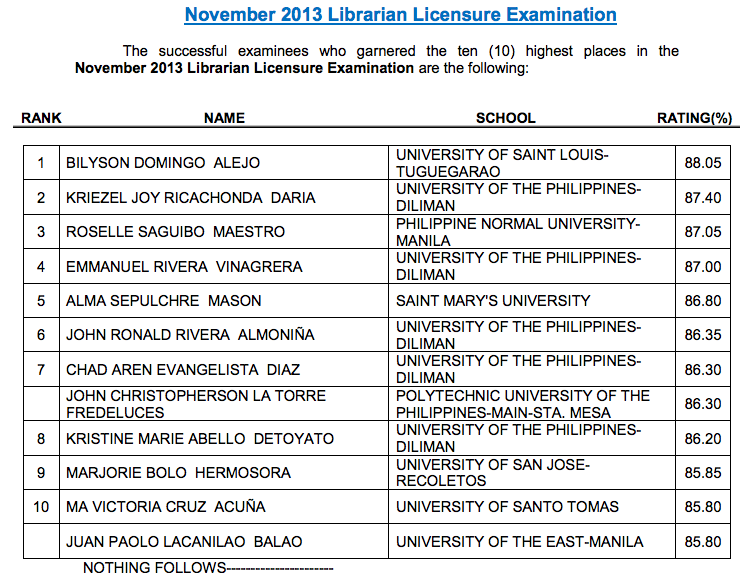 Congrats UPSLIS #LLE2013 Takers! We made it! WOOHOO! MAY BAGO NA KONG VALID ID! YEHEYYY! LOLz. Iba pa 'yung batang nagsisiksik ng charm. Itong nagcurse sakin, nanlilimos lang talaga. In fairness, pinakaba nya ko ah. Haha. Pagusapan na yang mga plano natin. Hehe. Balik ako from Davao ng Nov10. I might ask about the PRC ID registration. Kekeke. Wala akong alam. congrats zeng!pinakita rin naman yung result sa papa mo at kila mamay,ang galing mo daw.sobrang proud kami sa achievements nyong mgkatabi.ang galing galing.im sure sobrang proud ng mama nyo sa inyo kya ipagpatuloy nyo ang ganyang mga achievements.bilib na bilib ako tlga sa inyo.saludo ko sa inyo.love you.